The Hobie Cat Company is proud to announce the 50th Anniversary Celebration of the Hobie Cat, scheduled for October 27th, 2018 at Doheny State Beach, Dana Point California. Originating from a few simple drawings and an innovative eye, Hobie Alter and his band of likeminded friends developed the Hobie Cat 14 in 1968. The Hobie 14 took a sport, sailing, that had been historically too difficult or too expensive for most people to participate in and made it easy. 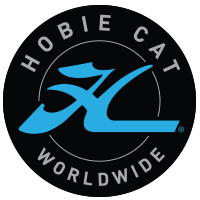 As the popularity for the Hobie 14 grew beyond the beaches of Dana Point, so did the need for increased production, ultimately leading to the creation of the Hobie Cat Company. The Hobie 14 spawned a community of catamaran enthusiasts across the globe, and kept Hobie’s innovative heritage alive and thriving..
Just as Hobie Alter had done via his revolutionary improvements to the surfboard in the ‘50s, the Hobie Cat Company re-imagined sports as varied as remote-controlled glider flying to hands-free kayaking to stand-up pedalboards,in a way that made them far more accessible, enjoyable, and performance-based, creating legions of new enthusiasts along the way. As a tribute to the Hobie Cat Company, and the legendary cats that started it all, the Celebration will feature the “Hobie Cat Funtastico” a 10-mile distance fun cat race that will launch from Doheny State Beach and sail past historic Hobie landmarks along the way. Boat participation is limited due to safety, so be sure to register early for this once in a lifetime event. The Celebration is open to the public and will feature a great display of Hobie Cat culture and a day full of family-friendly activities. We hope you will join us on the beach where it all started! A discounted block of rooms have been reserved at the Double Tree, directly across the street from Doheny Beach. To book the hotel the deadline is Thursday October 4th.